You are sure to leave them wide-eyed upon opening this magical holiday vip gourmet holiday Christmas gift basket. This deluxe assortment of gourmet foods include both sweet and savory delectable treats enough for everyone to enjoy. Some of the featured products include smoked salmon, vineyard estates merlot cheddar gourmet cheese spread, three pepper blend water crackers, Lindt white chocolate truffle, Godiva milk chocolate tablet bar, Chambery double chocolate crackle cookies, fontazzi butter toffee pretzels and much, much more. This basket is sure to leave a lasting impression this holiday season. You are sure to leave them wide-eyed upon opening this magical holiday vip gourmet holiday Christmas gift basket. This deluxe assortment of gourmet foods include both sweet and savory delectable treats enough for everyone to enjoy. 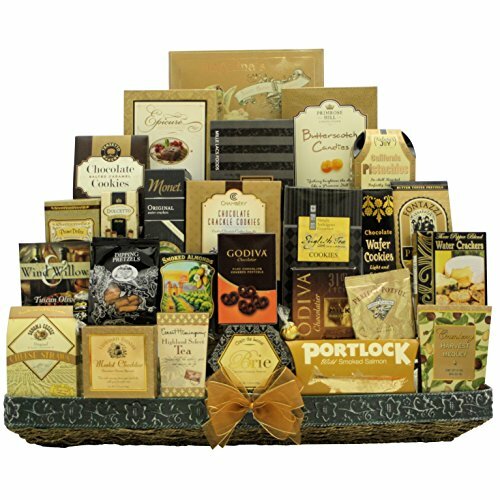 Features smoked salmon, vineyard estates merlot cheddar gourmet cheese spread, Lindt white chocolate truffle, Godiva milk chocolate tablet bar, Chambery double chocolate crackle cookies, fontazzi butter toffee pretzels and much, much more.